Traderr's Narrative took a good look at market internals to get a feel for the current market. His conclusion was that markets were in a bit of limbo; bearish - but not bearish enough to suggest a wash-out of weak hands. HeadlineCharts suggests Financials are approaching a bottom while Tech strength remains firm, even in the face of recent selling. But the New high/New low count for the Nasdaq was worrisome if you are a bull. I do think tech will succumb to increased weakness in the semiconductors after it breached May reaction lows, given the latter index has done much of the leg work since March to keep the broader rally afloat. However, Nasdaq, Nasdaq 100 and the semiconductors all closed at major moving average support (50-day or 200-day MAs), so if they were to bounce Wednesday would be a good day for it. 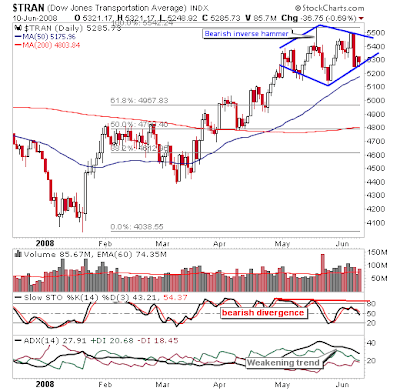 I'll be watching the Transports closely. The index may have formed a diamond top. A move to the 50-day MA would constitute a break of this pattern, and a break of the 50-day MA would suggest a likely push down to the 200-day MA (and 50% Fib retracements). The bearish divergence in stochastics on weakening trend [ADX is falling] also points in favour of downside.